ASICS Managing Director Allan Russell (left) and Western Bulldogs CEO Gary Kent (right) celebrate the five year partmership. The Western Bulldogs have today announced a new apparel partnership with global sporting goods giant ASICS. The ASICS logo will adorn Western Bulldogs on-field apparel for the next five years, with the partnership extending to 2021. The Club’s guernsey will see the traditional red, white and blue hoops remain, along with an additional red detail on the collar. The 2017 guernsey will also feature the AFL premiers gold logo. A leading running shoe brand for enthusiasts and professional athletes, ASICS is at the forefront of the world performance sports market and continues its rapid growth in the apparel space, with innovative design, research and technology key features of their range. 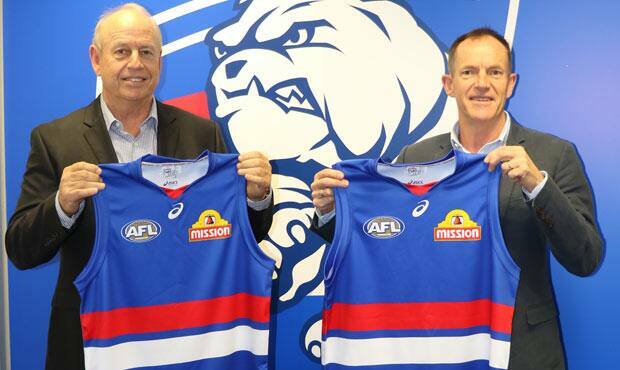 Bulldogs CEO Gary Kent said the Club was thrilled to partner with the international sporting goods brand. “To partner with ASICS, who are such an iconic name in sporting apparel and footwear globally, is another big step forward for our Club. “It’s important to us that we partner with compatible brands, and ASICS’ focus on people, community, innovation and performance ensure we have some important shared focuses. “Our players and staff will benefit from ASICS’ high-quality apparel range, while we are also excited about the comprehensive apparel offering for our supporters and members. ASICS Managing Director Allan Russell said the brand also looked forward to partnering with the Bulldogs. “ASICS is delighted to partner with the Western Bulldogs Football Club from 2017. “As a brand driven by innovations in sporting footwear and apparel through sports science, we look for like-minded partners to grow with as we strive to achieve our growth plan in 2020. “Through their involvement with Victoria University on sports science research and the innovative way the Bulldogs run their club both on-field and off-field, there are many synergies between ASICS and the Western Bulldogs.